Shop for eyewear, specialty pet products, apparel and more at these new Calgary stores. Arc'teryx's first standalone Calgary store opened on 17 Ave. S.W. this year. Photograph courtesy of Arc'teryx. This year saw lots of changes to Calgary’s shopping scene. While several new brand name and local stores opened their doors, many others decided to change things up by relocating to new locations in 2018. The result is at least 25 new spots to pick up jewellery, a new bike, furniture, pet products and more. Here’s a look at some of the newest places to shop in Calgary. Before this year, Calgarians had to shop for Arc’teryx products at other retailers in the city or online. 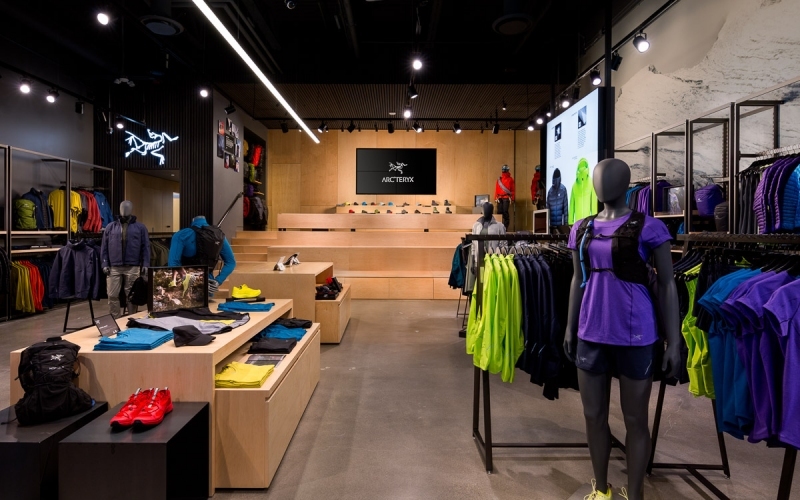 But now, they can get their hands on colourful outdoor gear, shoes and apparel at Arc’teryx’s first standalone Calgary store. The 2,395-square-foot store celebrated its grand opening on June 9 and has everything you need for your next outdoor adventure. And if you’re not sure what you want to buy, you can try select products out through the store’s free gear library. Calgary got its first Bailey Nelson location in Kensington last December, and now, shoppers will find the Australian-based eyewear company in CF Chinook Centre too. The store’s stylish glasses and sunglasses start at $145 and eye exams are available in-store. This past summer, local bike shop BikeBike announced that they would moving to a new location, and now, they’ve officially re-opened in Inglewood. The shop carries a range of bikes including Riese and Muller electric bikes, Frog children’s bikes and Surly adventure bikes. You can also pick up cycling accessories like locks, racks, cargo trailers, baskets and more. This summer marked the arrival of Calgary’s first three Bikini Village locations. Now open at CF Chinook Centre, CrossIron Mills and CF Market Mall, the Canadian company carries swimwear for men and women from brands like Billabong, O’Neill, Azura, Rip Curl, Boto, Tropik and more. There’s also a selection of coverups, hats, bags and flip flops to help you prepare for your whole beach or swimming experience. Canadian eyewear company Bonlook has arrived in Calgary after opening its first Alberta storefront in CF Market Mall on October 20. Designed in Montreal, the Bonlook brand features stylish men’s and women’s prescription glasses and sunglasses. They’re also affordable — all eyewear is only $145 for the lenses and frames. Bonlook also offers optician services for things like eyewear adjustments or progressive lens measurements. Shop for casual, elegant furniture (much of which is Canadian-made) or ask about interior design services at this locally owned store’s new showroom. Country Living Furnishings & Design carries a wide selection of items ranging from bedroom furniture to light fixtures for the whole home. Two popular Inglewood shops officially moved in together this year. Fresh Laundry closed its storefront and moved into the same space as The Uncommons. The store as a whole is now called Dept., and according to co-owner Ian Davies, it’s like a “micro department store” that both Fresh Laundry and The Uncommons will live within. Shoppers will still find plenty of product brands from both stores at Dept., including Aesop, Herbivore Botanicals, Suit and Arborist. Finding a great pair of jeans that fit just right can be tough, but the search will be a little easier now with the arrival of a new denim store in Inglewood. Dutil, a Canadian company with locations in Vancouver and Toronto already, opened its third location in Calgary this past August. Located in Fresh Laundry’s former space, the store carries a selection of men’s and women’s denim from brands like Nudie, Naked & Famous, Levi’s, Rag & Bone, Doublewood and more. Repair and alterations services are also available. Whether you’re looking to re-design your home or simply pick up a new piece of furniture or two, you may want to visit Ethan Allen’s new design centre. Located in Deerfoot Meadows, the newly re-located store spans 8,000-square feet and has in-house designers to help you choose the right pieces for your space. Gardenia Flower Boutique is a beautiful addition to the Marda Loop area, and not just because of the lovely flowers it sells inside. Before the shop opened, the site was home to a 108-year-old bungalow. The shop owners renovated the building, turning it into a multi-level home with a front porch that features the flower shop on the main level. Inside the shop, guests can pick up hand-tied bouquets, floral arrangements and outdoor planters, as well as home decor items like candles. Say hi to the shop dog, a goldendoodle named Frankie, while you’re there. Gem by Carati recently moved into a sleek new space on Bankers Hall’s second floor. Along with gorgeous jewellery from brands like Noam Carver, Forevermark and Jorge Revilla, the store also has its own watch boutique (which features brands like Longines and Tissot) within the shop. Custom jewellery services are also available. Treat yourself while visiting CF Chinook Centre’s newest luxury retailer. Since opening at the end of October, Louis Vuitton’s new standalone storefront (which also happens to be its first in Calgary) has been making an impression with its selection of the brand’s shoes, purses, travel bags and accessories. Looking for a great deal on men’s apparel? Check out the new men’s consignment store Man of Distinction in Inglewood. With locations in Lake Bonavista and Okotoks already, this marks the store’s third location. Man of Distinction carries a range of menswear for pretty much every occasion, offering suits, denim, casual wear and a selection of boots, shoes and runners. You can also bring in gently used apparel to be considered for consignment. Melrose & Co. celebrated its grand opening in CrossIron Mills on March 15. The stylish women’s wear store carries everything you need to build up your wardrobe, from dresses and jackets to accessories like jewellery and bags. Minimalist table lamps, electronic power banks, makeup, stuffed animals, kitchen utensils — you’ll find all this and more at Miniso. This year, the China-based retail brand opened its first two Calgary locations within just over a month of each other — the first one opened in Beacon Hills Centre in mid-May and a second one opened at CrossIron Mills on June 16. Inside, shoppers will find items ranging from home decor to electronics to stationery for extremely low prices. Molly Marie’s Accessories celebrated its grand opening on July 21st. What sets this consignment store apart from others is that it’s dedicated to accessories. Stop by to shop for shoes, jewellery, bags and other accessories, then swing by Molly Marie’s nearby sister store Expressions Ladies Consignment to complete your look. Inglewood furniture store Mid-Century Dweller got a new owner earlier this summer. It’s now known as Murphy’s Mid-Century and the shop still carries furniture and home decor pieces in mid-century and Scandinavian styles (particularly from the 1950s to ’70s). Shoppers will find a great selection of tables, chairs, lamps, clocks, cabinets and more. Murphy’s also buys furniture and home decor, so reach out to them if you have a piece you’re hoping to part with. Nanao Kimono opened its new storefront in Kensington at the beginning of December. Specializing in Japanese lifestyle products, the store carries a colourful selection of ceramics, Furoshiki cloths, Tenugui towels, Tabi socks, bags, bento boxes and more. You can also still visit Nanao Kimono at its Crossroads Market location. Our pets deserve the best, and you’ll find just that at this beautiful new specialty pet boutique in Mission. The New Forest is owned by a husband-and-wife team who have more than 20 years of experience as pet shop and clothing boutique owners, respectively, so it’s safe to say they know their stuff. Inside The New Forest, animal lovers will find products ranging from hand-painted leashes by Nice Digs in Australia to pet toys by Ware of the Dog in New York. Shoppers can also check out a selection of home and gift items. Everyone loves getting high quality, brand-name fashions for a great price, so it’s no surprise that Calgarians are still flocking to Nordstrom Rack months after its first Alberta location opened in Calgary. The American retailer carries many of the brands you would find at Nordstrom, but at extremely discounted prices. In addition to apparel, shoes and accessories for men, women and children, Nordstrom Rack has a home section for those looking to spice up their decor. Purr clothing store has three locations in Calgary: one in Kensington, one on 17 Avenue S.W. and one in Inglewood. But the 17 Avenue S.W. store recently moved around four blocks west to fill a new space along the popular dining and shopping strip. While the previous location was split over two floors, the new store is larger and all on one level. It still carries men’s and women’s apparel, along with a selection of jewellery and accessories. The Raven’s Room, which celebrated its grand opening in the Devenish Building at the beginning of November, has arrived just in time to help with all your holiday gift shopping. Mainly focused on products made by local and Canadian artisans, the shop features animal mugs by Salty Seadog Designs, Sweet As Candy bath bombs, socks from Friday Sock Co., Hop N’ Flop cards and more. Located in Blame Betty’s former space along 17 Ave. S.E., Rite of Ritual is a treasure trove of mystical items. The store carries a wide selection of apparel, accessories, crystals, incense, tarot books, home products and more. Saks Fifth Avenue, one of Calgary’s most anticipated retail arrivals this year, opened in CF Chinook Centre this past February. This was the first Western Canada location for the New York City-based company. Spread out across around 115,000-square-feet and two floors, Saks Calgary offers luxury men’s and women’s apparel, accessories, shoes, jewellery, cosmetics and more. If you get hungry while shopping, you can grab a bite at the in-store Italian restaurant, Buffo. You no longer have to go all the way to CrossIron Mills to shop at Saks Fifth Avenue Off 5th — the American chain opened a second Calgary location by Market Mall this past summer. Spanning just over 25,000-square-feet, the store is a great place to look for deals on designer fashion. Correction: This story has been updated from its originally published version to reflect the correct address of the new Gems by Carati location.